It sounded like it was some combination of electrical fault and large pots of cooking oil in the kitchen; the occupant was a chef at Bullock's and liked to fry stuff. James W. Blackwell, brother of WT Blackwell (of Blackwell's Durham Tobacco fame) built his house at the southwest corner of Lee (later Duke) Street and Yancey Street sometime between 1881 and 1887. 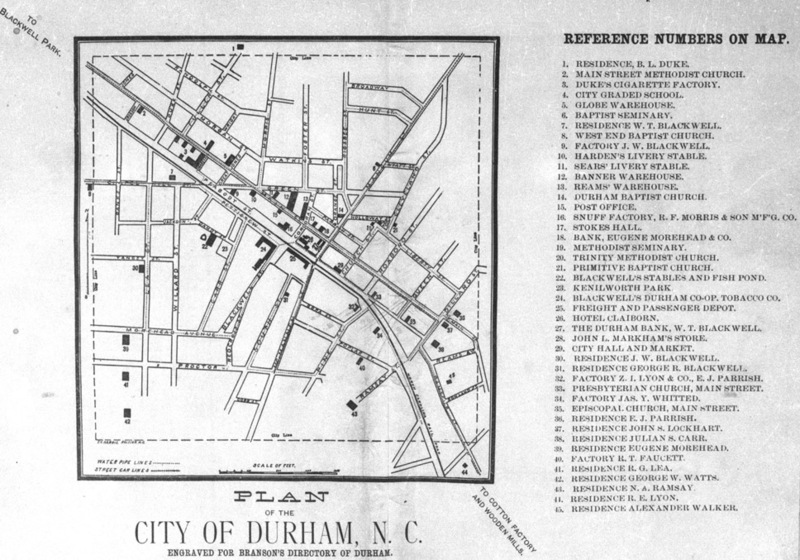 That house first appears in the City Diretory of 1887, which included a map of prominent Durham locations. 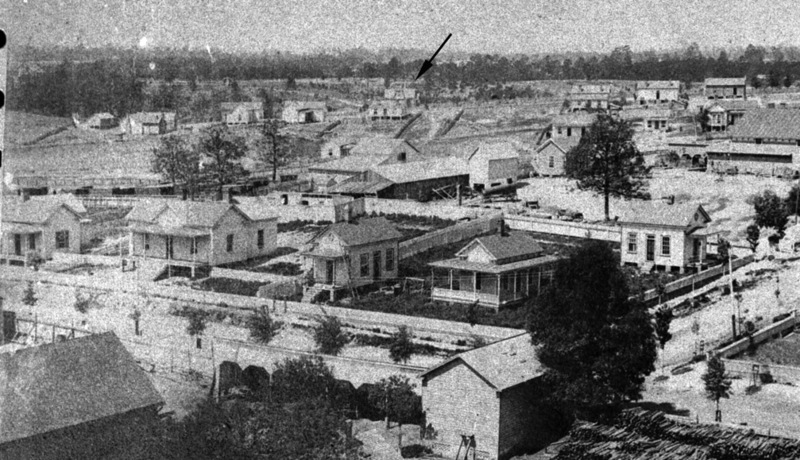 Below, an early photograph, taken sometime in the 1880s, from the vantage point of Blackwell's Durham Tobacco Co. (later the American Tobacco complex,) looking west, shows the 602 South Duke Street house sitting at the edge of the developed area southwest of the center of town. Looking southwest, 1880s. I've noted the 602 South Duke house with an arrow. The 602 South Duke house, with unusual trapezoidal gables and cruciform layout, is visible on the 1891 Bird's Eye of Durham, above. The 602 South Duke house was the site of the genesis of the Second Baptist Church (later Temple Baptist Church) which began as a bible study in the house before William Vickers gave the land to establish the sanctuary on West Chapel Hill St.
Blackwell had a number of careers, including work with the tobacco company, head of the Builder's Manufacturer's Supply Co., and a cashier for the Durham Water Company. He also bought and sold real estate and later lived at 701 Jackson St. after selling the 602 South Duke house in the 1890s. In 1901, the 602 South Duke house was owned for a time by HN Snow, who subdivided the large lot that the house was on, constructing 505 Yancey, 507 Yancey, and 604 S. Duke on the original lot in addition to the 602 South Duke St. house. 505 and 507 Yancey were constructed as similar, triple-A roofline cottages, hall-and-parlor style, each with a two room wing extending back from one of the rooms. The center hall exited onto a rear porch that extended the length of the wing and provided access to those rooms to maximize bedroom space. 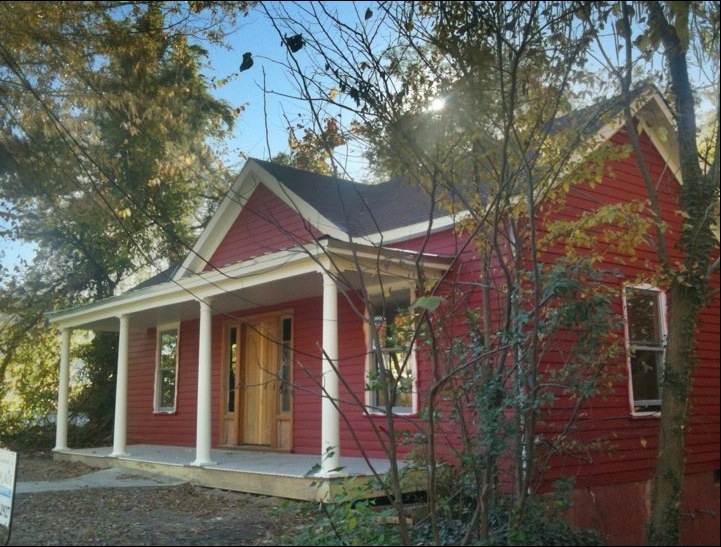 It's often interesting how small houses of this era not intended for the wealthy nonetheless had special details; for example, 505 and 507 Yancey St. both had two-leaf (French) doors on the front. Laborers, primarily connected with the tobacco companies and the railroad, lived in the houses during their first 17 years. On March 6, 1918, 505 and 507 Yancey were sold to Durham Realty and Insurance Company. On June 18, 1918 DR&I resold the property to Liggett and Myers (with 507, as a single parcel.) Liggett evidently rented the houses - I assume to their employees. However, 3 years later, Liggett decided to dispose of the various properties they had purchased in 1918. They sold the properties to First National Trust in February 1921. First National Trust divided 505 and 507 into individual houses/lots. On October 29, 1921, FNB subdivided the parcel in two (between the two houses) and sold 505 Yancey to JH Rutlege and his wife - whose name at first glance appears to be a poker hand: Nine High Rutlege. On April 29, 1926 the Rutleges sold the house to John Noel and Clara Brame. John Brame worked as "fixer" / machine operator for Liggett and Meyers. The Brames would live in the house for the next ~40 years. On May 2, 1966, the widowed Clara Brame conveyed the house to her son, Sam(uel) Thomas Brame. The house then became rental property again. 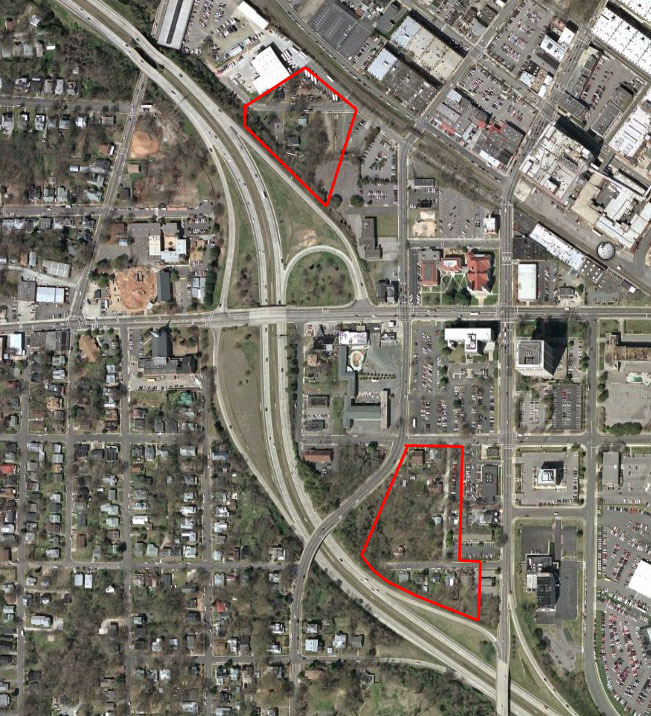 The southern (lower) of the two areas outlined in red is the small residential pocket containing 505 and 507 Yancey Street. The former connection with the neighborhood to the west is still apparent. At some point in the 1960s-1970s, 505 Yancey St. was converted to a duplex. On January 2, 2010, the house burned badly, resulting in total destruction of the rear room (kitchen) and roof. In March 2010, the house was acquired by the owner of the adjacent house (507 Yancey Street,) Gary Kueber. Gary did a 'shell' renovation of the house over the course of 2010, replacing the entire, badly-burned roof structure, removing various plastic 'enhancements' and returning the facade and floorplan to the original layout. 50 years after the original 'demolition by zoning' applied to this neighborhood, it appears that a strong real estate market is making the conversion a reality. In the aerial towards the beginning of this post, I showed two residential pockets that remained on the north side of the freeway in the 2000s. As of 2018, the top of those two is completely gone. 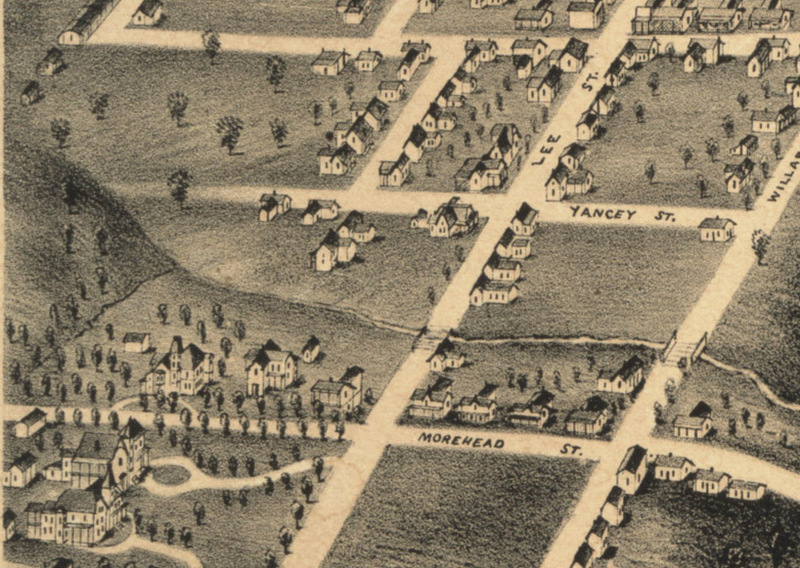 The Yancey pocket is much-diminished with the removal of these two houses and the full clearing and demolition of the houses in the entire block bounded by Gordon, Jackson, Yancey, and Gregson. Only three historic houses remain on this street and in this pocket as of August 2018.